The Black Tortoise or Black Turtle is one of the Four Symbols of the Chinese constellations. Despite its English name, it is usually depicted as a turtle entwined together with a snake. Furthermore, in East Asian mythology it is not called after either animal but is instead known as the "Black Warrior" under various local pronunciations. It is known as Xuanwu in Chinese, Genbu in Japanese, Hyeonmu in Korean, and Huyền Vũ in Vietnamese. It represents the north and the winter season. In Japan, it is one of the four guardian spirits that protect Kyoto and it is said that it protects the city on the north. Represented by the Kenkun Shrine, which is located on top of Mt Funaoka in Kyoto. The creature's name is identical to that of the important Taoist god Xuanwu, who is sometimes (as in Journey to the West) portrayed in the company of a turtle and snake. During the Han dynasty, people often wore jade pendants that were in the shape of turtles. Because of the ancient Chinese influence on Japan, honorific titles and badges in Japan also often referred to the turtle or tortoise. The northern gates of Chinese palaces were often named after the Xuanwu. Most famously, the Incident at Xuanwu Gate, where Li Shimin killed his brothers Jiancheng and Yuanji and seized power in a coup, took place at the north gate of the Taiji Palace, in the north of Chang'an. 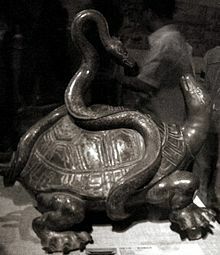 In ancient China, the tortoise and the serpent were thought to be spiritual creatures symbolizing longevity. 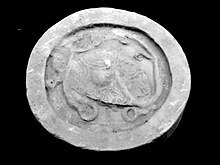 The Fujianese custom of building turtle-shaped tombs may have had to do with the desire to place the grave under the influence of the Black Tortoise. Xuanwu subduing the tortoise. Wudang Palace, Yangzhou. In the classic novel Journey to the West, Xuanwu was a king of the north who had two generals serving under him, a "Tortoise General" and a "Snake General". This god had a temple in the Wudang Mountains of Hubei and there are now a "Tortoise Mountain" and a "Snake Mountain" on opposite sides of a river near Wuhan, Hubei's capital. Taoist legend has it that Xuanwu was the prince of a Chinese ruler but was not interested in taking the throne, opting instead to leave his parents at age 16 and study Taoism. According to the legend, he eventually achieved divine status and was worshiped as a deity of the northern sky. According to another source, once Xuanwu had begun his study of the Way, he discovered that he must purge himself of all of his past sins to become a god. He learned to achieve this by washing his stomach and intestines in the river. Washing his internal organs, his sins dissolved into the water in a dark, black form. These then formed into a black tortoise and a snake who terrorized the country. Once Xuanwu learned of this, he returned to subdue them as in the other story. Wikimedia Commons has media related to Black Tortoise.